Soho Cigar Bar has been serving up cigars and spirits on Watts Street since 1998, but it was known as Circa Tabac until 2014. 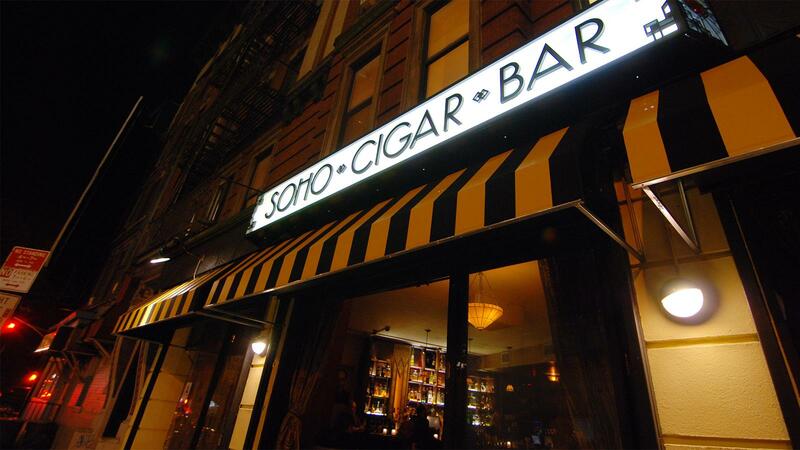 At Soho Cigar Bar, you can't help but feel pangs of nostalgia for old New York. But this downtown cigar and cocktail lounge is anything but stuck in the past. From the candle-lit cocktail tables laden with ashtrays to the portrait of the Rat Pack adorning the lounge, the ambiance is that of a classic bygone-era cigar haunt—the clientele, however, is not. On a recent visit early Friday evening, two couples sat beneath dim lights sipping Martinis, while a small party celebrated a birthday at one of the more intimate booths in the back of the lounge. A bearded young professional, sitting at the bar, plucked away on his Macbook while puffing on a cigar. The crowd here seems younger, more diverse; different from the folks you'd expect to meet frequenting the city's waning lot of cigar-friendly establishments. This isn't just a nod to the bar's location in New York's ultra-trendy SoHo neighborhood. It's the result of a conscious effort put forth by proprietor Lee Ringelheim to bring premium cigars and libations to the city's mainstream nightlife. "The message has been the same since the beginning," says Ringelheim. "I want to make cigars and whiskey approachable for anyone." Soho Cigar Bar's main lounge area, noted for its Art Deco-inspired decor. At Soho Cigar Bar, the cigar menu is broken down into easy-to-understand categories, such as full, sweet, spicy and light. The whiskey, which is stacked several shelves high above the bar, is categorized in a similar fashion, and varies in style and price. There's also an extensive list of flights and cigar pairings. Looking to better familiarize yourself with peaty Scotch? Order up a flight of Laphroaig 10 year, Bunnahabhain 12 year and Talisker 10 year for just $30. Want a taste of the very best? Try a flight of Dalmore 25 year, Macallan 25 year and Balvenie 30 year. It will cost you north of $200, but keep in mind, this is still Manhattan. Ringelheim opened the establishment in 1998 under the name Circa Tabac. In 2014, he briefly closed for renovation and reopened as Soho Cigar Bar. The project included a state-of-the-art ventilation system—and it's one of the best in the city. "Money wasn't a consideration when I put it in," he says. Ringelheim knew a solid ventilation system would help attract non-smokers who still wanted to enjoy the selection of libations or sip a cocktail among cigar-smoking friends. "We ended up installing twice as many [ventilation systems] than what's required." Soho's bar houses an extensive selection of spirits. The menu offers whiskey flights, as well as pairing recommendations. Soho also strives to offer competitive prices. Ringelheim says his menu is about 30 percent cheaper than his Manhattan competition. For cigars brought from outside, there's a one-time cutting fee of $10, but if you spend more than $25 on food or alcohol, they'll waive the fee. The menu offers cigars from well-known brands like Arturo Fuente, AVO, Nat Sherman and Alec Bradley, but almost half of the cigar sales come from Soho's house brand. Ringelheim says his smokes are produced at an undisclosed rolling gallery somewhere within in the confines of the Five Boroughs. Maybe the mystery is the allure. Either way, the cigars are quite successful. He says he sells about 1,500 a month. Soho Cigar Bar operates primarily as a cocktail bar, but it can also be a good place to watch the game. There is a kitchen, that offers a small menu of appetizers and flatbread pizzas. And remember that portrait of the Rat Pack? On game day, Frank, Dean and Sammy—along with several other pieces of artwork—fold open to reveal large-screen televisions. Monday through Wednesday: 5 p.m. to 2 a.m.
Thursday through Saturday: 5 p.m. to 3 a.m.
Sunday: 5 p.m. to 2 a.m.